"Hi, I got iPhone 8 a month ago. I was excitedly using it and everything was going well until yesterday. I was unable to use my iPhone 8. The home screen of my iPhone would not response when I tap or swipe the screen. It seems the home screen freezes. The strange thing is that I can access the Control Center but no app can be opened. Do you have any idea why my iPhone 8 home screen is frozen? Please help!" We can understand how irritating this is when the screen becomes unresponsive and you become unable to operate your iPhone properly. The irritation doubles when the device is brand new specially when you bought just a while ago and didn't get much time to enjoy its new features and functions. If you are fed up with unresponsive home screen problem with your iPhone 8, don't worry, simply performing a hard reset may solve the issue or if the issue is different, we have got some other solutions for you. Let's figure out how you can solve it. Start pressing the "Volume Up" button and release it instantly. Now, repeat this for "Volume Down" button as well. 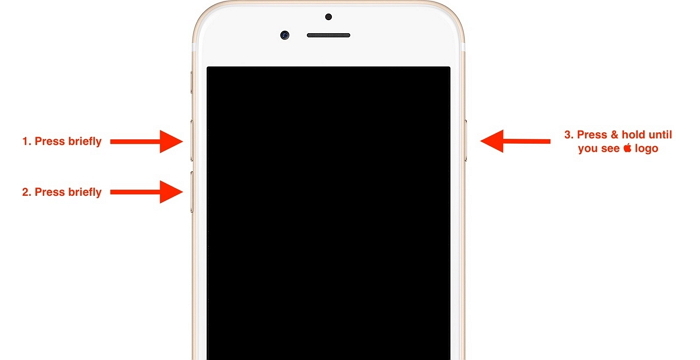 After performing two steps, keep pressing and holding the side button or "Power" button until the moment you see the Apple logo on your screen. This is what how to hard reset your iPhone 8. Now, check if still the iPhone 8 home screen becomes responsive or not. If the screen is still frozen and giving hard time in responding, it could be a software glitch. To resolve this software issue that is triggering and making the iPhone 8 home screen unresponsive, we would suggest you to make use of iMyFone D-Back which is can fix various iOS problem with no data loss through its "Fix iOS System" feature. The tool is completely safe to use and is recommended by unlimited users and renowned media sites. It is now compatible with iPhone 8/iPhone X and iOS 11.1. "Fix iOS System" feature is composed of three different modes namely "Standard Mode", "Exit Recovery Mode" and "Advanced Mode". 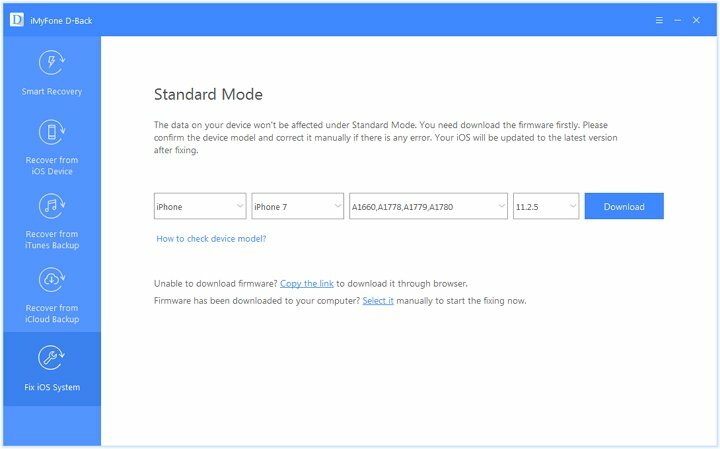 The Standard Mode will not affect the data on your device. It has the power to fix countless iOS problems like iPhone stuck with Apple logo, ringtone/speaker problems, white/black screen and much more. The program is an iPhone data recover tool which supports to recover more than 20 types of data, for example WeChat, contacts, messages, photos, WhatsApp data and more. You can also recover data from iTunes and iCloud backup using this program. Step 1 – Launch the program in your computer and choose "Fix iOS System". Connect iPhone 8 to PC and select "Standard Mode" from the main window. 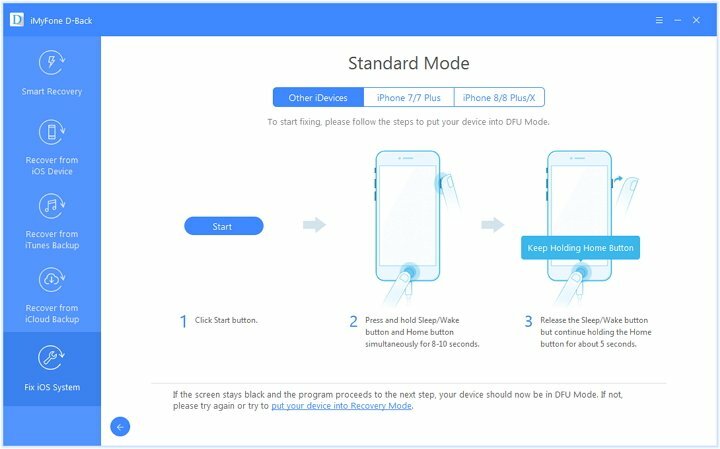 Step 2 – Put your iPhone 8 into DFU mode. You can go along with the steps coming on the screen for the same. Step 3 – The program will recognize your device and will provide you latest firmware itself on your click on "Download" button. Step 4 – After downloading the suitable firmware, click on "Start to Fix" option and let the issue get fixed with the program. You can also use iTunes to restore your iPhone through DFU Mode. That will reinstall iOS on your computer completely. All the data and settings on your device will be erased in this way. Here are the steps you need to follow if you want to perform this method. Launch iTunes and connect iPhone 8 to PC. Give a quick press to the Volume Up button and then Volume Down button. Now, press and hold the side button until you find screen going black. Release the side button when screen blacks out. After this, start pressing Side and Volume Down buttons simultaneously for 5 seconds. Release the Side button and keep holding Volume Down button until you see the iTunes prompt that it has detected the device in recovery mode. Please note that the screen of your iPhone 8 will be black when it is in DFU mode. Hit "OK" and then click on "Restore iPhone". Confirm your actions and wait for the process to complete. If unfortunately, you didn't get to any positive result, the last option that we would recommend you is to replace the device if it is under warranty. There is no point keeping the unhealthy device to you. Just run to the store and get your iPhone replaced with the new one. That's all about fixing iPhone 8 home screen frozen issue. We can understand the pain when we get the new iPhone with great excitement and find some problem with it. This is intolerable. Therefore, we presented some easy fixes that you can try to get your iPhone 8 home screen back to normal at home. We hope that we were able to provide you what you wanted and you are happy with the results.